One thing WROV had that K92 didn't was a long history serving the Star City. They made use of this by reminding people they could "depend on" WROV. Being a local AM station meant they could focus on Roanoke issues, which K92 couldn't do without alienating their regional listeners. And in March 1981 they reminded the audience of their history by having a "Hall Of Fame" Weekend which featured oldies and old jingles, including the WROV "chimes" from the 1960s. The highlight of the weekend was to invite some of the station's past stars and personalities to return to do shows. But Jerry Joynes and Gary Cooper worked for the competition. Dan Alexander was busy. Nobody knew where to find Jivin' Jackson (who, unknown to the staff at the time, had passed away) or Ron Sunshine. But Fred Frelantz and Jack Fisher were still in town in advertising and enthusiastically agreed to do the Saturday afternoon show. Jack was to work "solo" from noon to two, then be joined by Fred for a reprise of their 1966 two-man show, the Fisher-Frelantz Fling. Neither had done a radio show for over ten years, expectations were high and some wondered if they would be able to pull it off. Jack Fisher and Fred Frelantz returned to WROV in March, 1981, as funny as ever! Well, all doubts were erased when Jack sat down, turned on the mike and was as entertaining and witty as ever. Listeners could tell that he was having a blast and loving every minute of it. And when Fred came in at 2:00, both showed that the magic and chemistry they'd had in the 1960s was still alive and well and they sounded better than ever. Though the show was only supposed to go until 5:00, Jack and Fred were having so much fun they stayed two extra hours, then agreed to return one Saturday every month. Pat Garrett was the person chosen to work with Fred and Jack that day, keeping the transmitter logs, finding them records, etc. so that they could focus on answering the hundreds of phone calls and doing their show and says "the absolute highlight of my entire 18 years in broadcasting was being part of Jack and Fred returning to WROV. Both had been my idols while growing up and for me this was a BIG thing. And just as you'd expect Joe Montana to be able to walk onto the field years after retirement and throw a perfect fifty-yard pass to Jerry Rice, Fred and Jack showed that even after 15 years, they were still the best." During the summer of 1981 a new chain of 24-hour restaurants opened in Roanoke, The Brown Derby Pancake House and Country Kitchen. 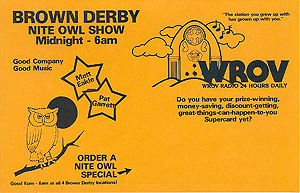 With hours and a menu similar to the Waffle House or IHOP, the Brown Derby decided to make a pitch for the Roanoke all-night crowd by sponsoring Matt Eakle and Pat on what became known as "The WROV Brown Derby Nite Owl Show." The restaurants put out table cards advertising the show, and Matt and Pat read sponsorship announcements twice an hour. As part of the deal Matt and Pat were invited to have dinner at a Brown Derby so they could go back to the station and talk about how good the food was. The Brown Derby put these cards on their tables when they sponsored the all-night show in 1981. "We went to the one that was on Franklin Road in that building that's now a discount cigarette & tobacco store. I can't remember what Matt ordered but I ordered a hamburger 'Texas Tavern' style (with pickles, onion and mustard). They brought it, I bit into it and started crying. The slice of onion was about half an inch thick and it was NOT a mild onion. I wiped my eyes, looked at Matt, then at the table card, then back at Matt—who was enjoying his food about as much as I was enjoying mine—and said 'Oh my GOD, our names are associated with this place!" Ever hear the phrase "media jinx?" The term, usually associated with Sports Illustrated covers, implies that after someone is prominently featured in the media, bad things often happen. This appeared to be the case with WROV when, in late July 1981, Dan Smith of the Roanoke Times & World News did a feature story titled "PERSONALITIES - WROV DJs keep small station big." Two weeks later, Bart Prater left WROV after thirteen years for K92. 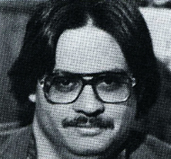 This picture of Bart appeared in the July, 1981 RT&WN article that "jinxed" the station. The newspaper reported that this was because Bart and Burt Levine "could not reconcile differences over the change in emphasis" at WROV. Burt and Bart had developed a "father - son" sort of relationship over the years which was not without a bit of friction at times. In a last gesture of autonomy, Bart played his last record, his favorite South City Midnight Lady by the Doobie Brothers, and over the introduction told the listeners "Goodbye, 'til we meet again.......IN STEREO." But the truth was that Burt knew Bart wasn't happy and let him go. According to Burt, "(Bart's) a kid at heart, and when K92 came along and we moved away from the teen focus, he wanted to go along, but he had trouble. The departure was painful. In the end we waived the non-competition part of his contract." On Bart's last day Bruce Jacobson presented him with a section of the building's wall. And if this wasn't demoralizing enough to those who remained, a mere nine days later Barry Michaels announced he was also leaving for a job at WKTM-FM in Charleston, SC. 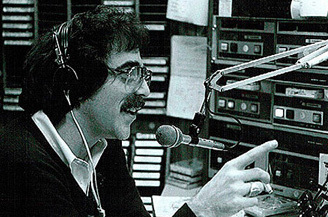 Barry said his departure was a step toward his goal of becoming a major-market morning personality and that it had nothing to do with the change in programming at WROV, though he did add that WKTM was a personality-oriented rock and roll station. Of the WROV "big three" two were now gone. The newspaper commented on the "jinx" aspect of this in a small story featuring a drawing of a black cat. Rob O'Brady remained but, incidentally, had some bad luck of his own in August, breaking his arm during a WROV Rovers softball game. Yet he continued doing his morning show as Matt Eakle moved to mid-days and Seth Williamson took over the afternoon show. And, though only part time, the staff still included Larry. A tough act to follow! Seth Williamson and K.C. Jones did afternoons in the months following the departure of BP. Poor Seth had the unenviable task of being the first person to do the WROV afternoon show since Bart took it over in 1970, a job that would have been like trying to replace John Lennon in The Beatles. Seth soon moved on to a job in public radio and was replaced by High Point, NC native K.C. Jones. John stayed on 7 - midnight and Pat was back on the all-night show. When Pat returned to his studies at Virginia Western Community College that fall, local DJ and musician Cliff Beach was hired to be the new "night owl." In December 1981, WROV added its third-ever female personality, June Poteat. June was from Burlington and had worked at WBBB when Dave Shropshire (Chris Stevens) was the program director. June came to WROV and did the midnight - 6 show. When K.C. 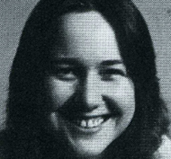 Jones left for a job in Wilmington, NC, John King moved to afternoons and June took over the 7 - midnight shift. Uncle Larr in the Production Room, 1981. June remembers "WROV was one of the best jobs ever. We had a tight staff and the audience was into the station. It was an incredible time in my career. I remember my first trip to Roanoke. I was struck by the Catholic Church and its majestic place in the skyline. The minute I met Burt, I knew he was different from anyone I had ever known. He and Muriel knew how to create and nurture talent. "I will never forget having a talk, like father and daughter, about wanting to be the best but not become conceited—like some jerks I had worked with before. Burt said there is a difference in confidence and conceit and he wanted me to feel confident. Anyway, I was hired right around Christmas and will never forget the party. He had wonderful food brought in and two or three cases of champagne. 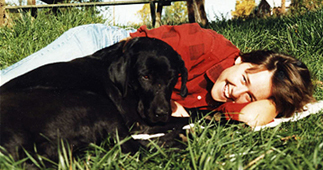 June Poteat with her dog Eurie in 1983. John King ended up with the fire extinguisher and we were sliding up and down the hallways on the foam. Even serious newsman Rick Mosher got in on it! I thought 'this is my kind of place!' It seems that night I was on the air and Burt's daughter came by. We were talking and I somehow managed to play the same song twice. In her true brilliant Levine way she said 'say we like that song so much we played it twice.' It must of been a good trick because the phones lit up like crazy!" 1982 marked Roanoke's 100th year as a city and the entire year was filled with Centennial activities. WROV was right in the middle of the celebration. Station promotions included having listeners nominate a Valentine's Day "Sweetheart Of The Year" as well as more Supercard-related contests and 1950s - 1960s style dances. One, held on the City Market in May, was called "WROV's Come As You Were High School Reunion" night and featured jitterbug, twist, disco contests and music by The Castaways. Over 7,000 people attended, making it a big success though the temperatures fell into the cool 50s that evening. The party, incidentally, was crashed by members of the K92 crew who showed up in their van and handed out bumper stickers. The Roanoke Centennial was honored on WROV with a contest involving these cards. On May 16, the city's actual birthday, the valley celebrated by having a parade down Jefferson Street. About 20,000 people showed up, stood in the hot sun, and got sunburned watching a show one person said was "better than anything I've ever seen on TV." The parade had 5,000 participants including baseball great Boog Powell and football's Mean Joe Greene. 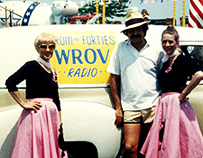 WROV's "float" consisted of one vehicle from each decade the station had been on the air along with dances performed by "Bootie's Belles," a chorus-line dance group featuring Ellen Dowdy and choreographed by Bootie Chewing of Vinton. Each time the parade stopped, the girls hopped out of cars and did a dance for the spectators. About this time, Pat Garrett left WROV for a weekend job at K-92. "In retrospect," says Pat, "that was probably a mistake. I had a big ego, wanted to be #1 again, and work once more with Bart. But I would probably have been much better off if I had stayed at WROV. I think Burt would have eventually given me a full-time job, instead, I ended up going to K-92, whizzing off many of my former friends, working six months of weekend shifts and getting canned." The 1982 Roanoke Centennial Parade. Boog Powell & Bootie's Belles; Burt with wind-swept hair; James Norman with a VW Thing; Pete Kandis & the Belles with Pete's panel truck. Pat went on to work in Wilmington, Asheville and Raleigh, NC before hanging up the headphones for good in 1993 and admits "the K92 experience did come in handy when it got me a full-time job at a big, new FM station—Kiss FM in Asheville—in 1984." Cliff Beach left WROV around the same time to return to his music, and after both were gone, WROV hired long-time Roanoke personality John Andrews for the all-night show. 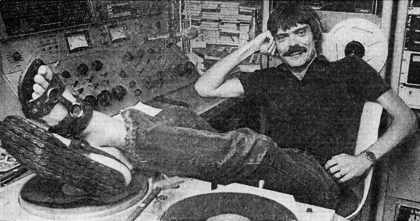 During high school John had worked at Pixie and then did a short stint on WROV in the late 1960s, and became well known for spending much of the 1970s on Q99. Also, Mark Thomas, who later would also work on WSAY and WFIR, come onboard to do weekends and later, the all-night show. WROV remained active and visible in the community throughout the year. Matt, Rob, John and June broadcast live from Roanoke's Festival On The River. And by Summer 1982, all saw that the effort was paying off. 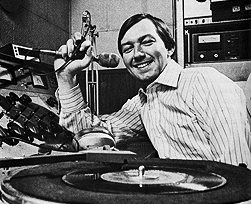 Though K92 finished #1 in the ratings and WPVR #2, WROV had by then climbed into the #3 slot and could boast of being the top rated AM station in town, beating out WSLC who was suffering from the loss of long-time star King Edward IV who passed away in 1981. 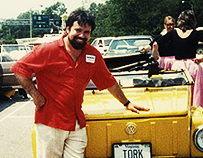 Rob & Bruce at the Roanoke Centennial Parade, 1982. Incidentally, by the summer of 1982, K92 could claim 6 former WROV personalities: Bart, Bill Jordan, Vince Miller, Larry Dowdy, Linda Silver, and Pat Garrett. Also, former WROV receptionist Carole Beane was at K92 working as an assistant to the programming department. Bucky, by then, had left K92 and was working at Q99 and as an engineer at WSLS-TV. 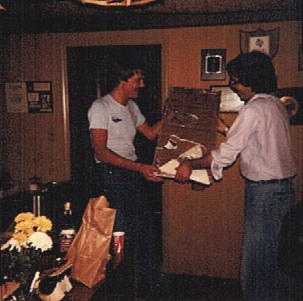 Summer '82 saw WROV hire a new program director. 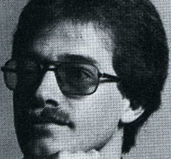 John Gabriel, from Albany, NY, was programming station WCHS in Charleston, WV. 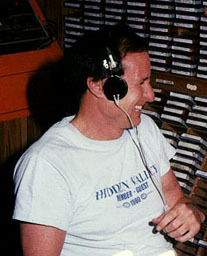 WCHS had once been programmed by Mike McVay and when Burt wanted a new PD to move forward with the station's "adult" oriented format, Mike suggested John for the job. His first assignment at WROV wasn't one he enjoyed. "My first job at ROV was to fire John King. This was difficult, since he sounded like he belonged on a major market station. But, my job was to take over afternoons and John took the firing nicely. He soon got a job in Richmond at WRVQ-94." A crowd of about 8,000 people rang in the new year of 1983 on the City Market at an outdoor celebration sponsored by Downtown Roanoke, the City Market Association and WROV. The party was the official "close-out" of the Centennial year. Bruce Jacobson and Matt Eakle were on hand with a crowd of folks of all ages who together drank 720 bottles of champagne. 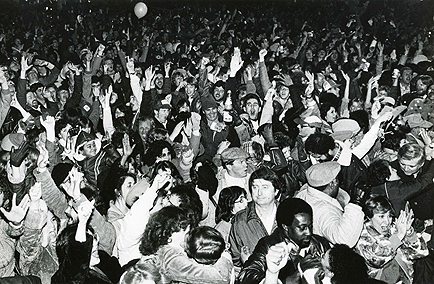 New Year's Eve 1982-1983 was celebrated on the City Market and the official close-out of Roanoke's Centennial year. Kazoos were handed out and the intention was to set a world record for the largest number of people playing "Auld Lang Syne" on kazoos, but Jeff Dickerson recalls that folks started throwing the kazoos at each other and it turned into "a game of dodge the flying projectiles." The turnout surprised Matt who said "we didn't think it would be anywhere near this, we thought everyone would have plans for New Year's Eve." The station broadcast live from the four-hour event. In February, 1983, WROV commemorated the end of the M*A*S*H TV show by hosting a "M*A*S*H Bash" at Tanglewood Mall. The promotion included contests to find Roanokers who looked like the M*A*S*H cast members, trivia contests and other related fun. John Gabriel, June Poteat, Matt Eakle in 1983. 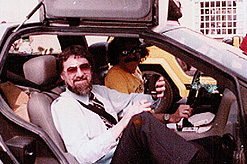 Throughout 1983, John Gabriel was the PD and afternoon man. Larry Bly continued his weekend shows and Jack Fisher continued his monthly show, though without Fred Frelantz who left to go "into full time show biz" with The Vikings, who were now being produced by Wes Farrell and going by the name Roanoke ( more... ). Matt continued doing mid-days. About this time, June Poteat, who wanted to work at an FM station, left for a job at WSLQ-99, so Bruce Jacobson, a newsman at WROV since 1979 and the former lead singer of The Royal Kings, moved over to the other side of the glass to do the 7 - midnight show. 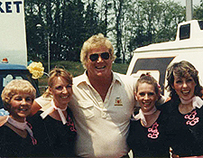 The station continued many public appearances at events such as the Highland Fling and Old Salem Days. 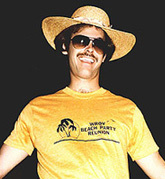 John Andrews at the Summer Beach Party Reunion, 1983. Fred and Jack were also there along with John Gabriel. WROV did a repeat of the previous year's successful event on the City Market. 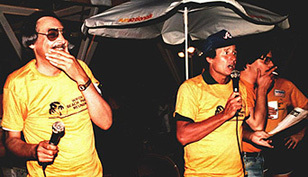 This year's event took place in August and was billed as the "Summer Beach Party Reunion '83." The station even had a truckload of sand and sea shells hauled in and dumped on the street for the occasion which included a "best beach hat" contest. Rob O'Brady continued doing the morning show and being a champion for charity. In October, Rob raised money for the Leukemia Society by taking part in the Cimmaron Rose restaurant's "Celebrity Wait Night," an event where local stars waited tables and donated their wages and tips to charity. 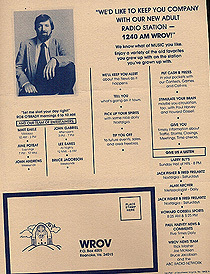 This 1983 ad was intended to position WROV as Roanoke's adult station. In early 1984, John Gabriel left and was replaced by Mike Chapman, who held the PD job for a short time before it went to Steve McFarland. 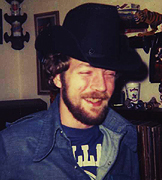 Steve was born in Roanoke, went to Patrick Henry High and had worked as a part-timer at WROV in the early 1970s. His radio career took him to Wisconsin, Milwaukee, New Orleans, San Francisco and Charlotte then brought him home. "I grew up listening to this radio station and I know the legacy. I'm close to Nirvana. I have the opportunity to come home and be with my folks and do my profession. I don't know that a guy could ask for more." Steve's arrival signaled the end of Rob O'Brady's long tenure as morning man, the show he'd done for nine years. Steve took over the morning show and Rob joined Bruce Jacobson on the afternoon shift. Saying "when you've got good talent who have proven themselves, let them do more" Burt billed the change as "a return to what we do well—making radio the exciting business it used to be." Rob and Bruce did an "off the wall" sort of show that made good use of the pair's long friendship and knowledge of each other. They went to movies, visited clubs and talked about it on the air. Matt continued doing mid-days, copy/promotions man Bill Young did the night show until Lee Eames was hired, and John continued on overnights. Another pairing of friends for a WROV show put Larry Bly together with longtime friend and "Cooking Cheap" co-host Laban Johnson. 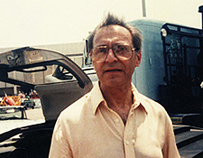 Bruce Jacobson moved from the news room into the studio in the mid 1980s. Larry and Laban did three Saturday afternoons per month with Jack Fisher and eventually, Fred Frelantz (back in 1985 from his stint with Roanoke) doing the other one. 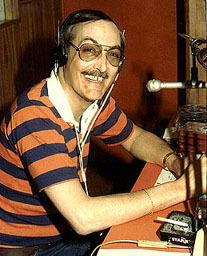 Larry described the show as "not so much of a comedy show as a combination of music and chit-chat and call-ins and call-outs. We don't want this to be your typical two stooges sitting behind the mike taking pot shots at each other." 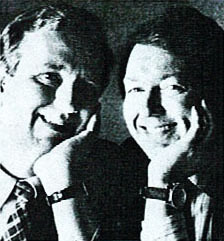 Laban & Larry in 1985. Despite Larry's description, the shows were hilarious. Movie reviews, public service announcements and contests were all done with the same off the wall, zany humor viewers enjoyed on their TV shows. At one point they did a take-off on across-town station WFIR's show "Ask Your Neighbor" by doing their own version featuring host "Dumb Old Ted" (a joking reference to WFIR's Ted Rogers). Larry later said he ran into Ted's wife who was not friendly to him at all. "Apparently she wasn't amused by our spoofing of Ted."